What is the average weight for these guitars ?I have found some of the '59's to be well over 9 lbs...about 9lbs.12 to 14 oz. and I really like lighter guitars and found a plain top '57 at 8 lbs. and 14 oz..(that is about the lightest plain top I have found,well,there was another at 8 lbs. 12 oz. )so can somebody help a brother out ? I would love to pull the trigger on a '59,but that seems heavy.The plain top is really in the ballpark weight wise,but not as visually appealing. Yes indeed..I got a very nice ObG double cutaway TV Yellow LP Jr. from Mark a few yrs. ago that has a really great neck,so I called him and got some really good advice . I will have to go to the Tokai-older . 8 lbs. is a sweet sweet weight....you are a lucky person !! 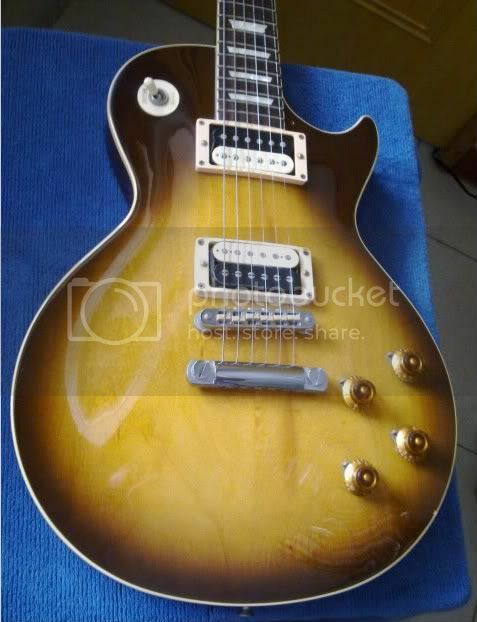 Crazy thing is....I think it was meant to be a K orville....(non by Gibson), as it has a couple of features common to that line....namely a 3 piece body, and neck heel cap. I do believe that more often than not great specs will give you a great guitar, but this guitar is the exception to that generalization. And in the end I'm more interested in great sound, than having a trophy guitar.